ST. PAUL, Minn. (CNS) — Hmong-American Catholics came in large numbers to the Cathedral of St. Paul May 26 dressed in native attire to celebrate the first U.S.-born Hmong-American to be ordained a priest. 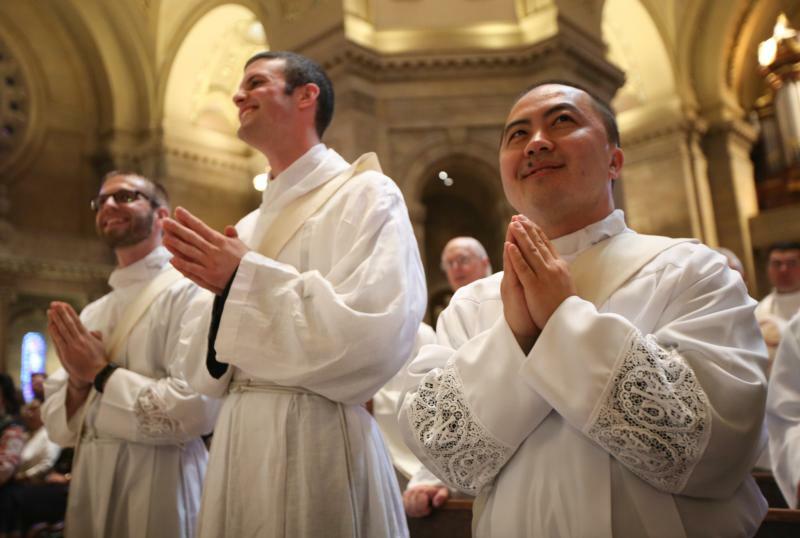 Although he is a Twin Cities native, Father Toulee Peter Ly, 35, drew Hmong-American Catholics from around the country — including California, Colorado, Iowa and Wisconsin — to the ordination, where he received holy orders with three other men. 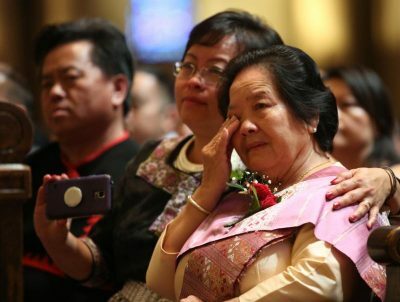 “I think there’s going to be a new spring in the Hmong Catholic community across the entire United States,” said Long Her of Fresno, California, who read the first reading at the ordination Mass. The seeds of Father Ly’s priestly vocation were sown while he was attending the University of Minnesota in the Twin Cities. During his college days, he was asked several times to work with the youth group at his parish, St. Vincent de Paul in St. Paul. However, “church was never a big part of my life,” Father Ly said, noting that he went to church on Sundays mainly to accompany his mom since his parents were divorced. He says his faith life was “pretty shallow” and to step it up, he decided to help the young people in his parish which he did for nearly five years, an experience which ultimately deepened his own faith. A dream in 2008 made him consider the priesthood for the first time. He dreamed he went to his parish one Sunday morning looking for a priest but couldn’t find one. That day at Mass the priest told the congregation he was leaving the parish because he had been reassigned. Part of the answer came when he thought about how being at church and involved with church ministries made him happy. He also thought about his ancestry. Growing up, he was well aware that for most of its existence, the Hmong Catholic community at St. Vincent had been without a priest who spoke the native language. In Minnesota, the Hmong community once had a French-born Hmong-speaking missionary pastor, but in recent years, it has relied on archdiocesan priests to learn to celebrate the Mass in their language. Because these priests can’t speak the language conversationally, many elderly Hmong Catholics depend on infrequent visits from a Hmong priest ministering in Thailand for confession and spiritual direction. “I want there to be someone to minister to the (Hmong) people, for sure,” said Father Ly, who learned his ancestral language growing up since it was spoken by his mother and eight siblings. All these thoughts added up to entering the seminary and he joined St. John Vianney College Seminary in St. Paul. His 10-year path included getting a bachelor’s degree in philosophy from the University of St. Thomas in St. Paul, plus taking two years off for more discernment after studying at the St. Paul Seminary School of Divinity. The discernment path including letting go of his own ideas about wanting to get married until he realized the priesthood is where his heart was. As his ordination drew near, he began to think about his future ministry as a priest and “just being on the journey with the people” to help them in their faith life. Although his first assignment is to a suburban parish with no Hmong population, Father Ly believes he will one day be assigned to work with the Hmong Catholic community. “I look forward to it because I think that’s something that will help our community, the Hmong community, grow stronger in their faith,” he said. After California, Minnesota is home to the largest population of Hmong-Americans in the U.S., and St. Paul has the nation’s largest Hmong-American population per capita. About 150 Hmong people regularly attend Mass at St. Vincent de Paul, with another 35 at St. Patrick, another St. Paul parish with a Hmong population. Parishioners from both parishes attended the ordination and expressed pride in Father Ly. “He’s setting the path for everyone else to start,” said Arthur Ly, Father Ly’s nephew, a St. Patrick parishioner. Hrbacek, Davis and Wiering are on the staff of The Catholic Spirit, newspaper of the Archdiocese of St. Paul and Minneapolis.